Parakeets appreciate a well-appointed cage. You've chosen the bird. You've procured the cage. 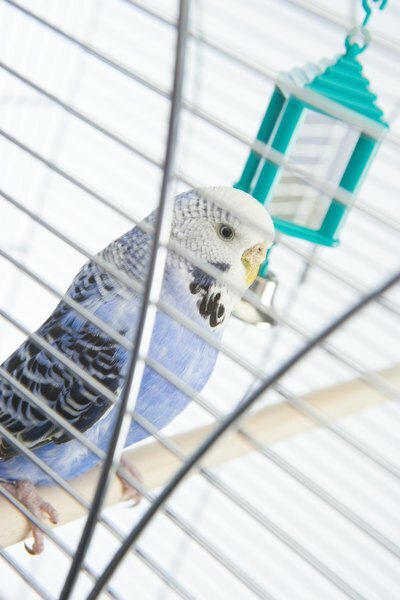 Now it's time to furnish and transform that cage into a happy home for your new parakeet pal. Everything you need is available at your pet store, so get furnishing! A bird needs to eat, and as a new pet parent you need to feed him. Water and food dishes hung on the cage's parameter come in handy here. If your cage is not already equipped with them, you'll need to secure at least two dishes, often referred to as “coop cups.” Stainless steel coop cups are easy to scrub and disinfect, while plastic cups can become scratched, allowing bacteria to grow in the crevices. If your cage happens to be equipped with plastic coop cups, consider upgrading to stainless -- your birdie boy will appreciate the move. Eating and drinking on the fly can be tough on a bird, and perches positioned in front of his coop cups will go a long way towards enhancing his dining experience. Basic cages often come with a couple of basic plastic perches. These standard perches are OK, but your special 'keet deserves better. Acquiring a few extra well-made wood and rope perches of different sizes and textures will add variety to his cagey life and encourage him to explore his new home from different perspectives. You may even want to create your own natural perches using branches from a real tree. Consult your veterinarian to be certain the type of wood is non-toxic. Your parakeet is very tuned into his body, which tells him when he needs calcium and other essential nutrients. Cuttle bones and mineral blocks installed to the sides of his cage will provide your bird with these nutrients when he gets that calcium call. And of course, what goes in comes out -- and what goes out, drops to the bottom of his cage. These droppings should be landing on some sort of absorbent, disposable cage bedding. There are a variety of cage bedding litters available in stores, but paper towels, newspapers or your ex's photograph will do just fine. Your new parakeet pal needs to be active and stimulated. He needs to jump, climb and perform acrobatic stunts. He needs toys. Favorite parakeet playthings tend to be swings, bells, ladders, hoops and balls. Ensure they are well-made and safe for your birdie boy, using the same discretion that would guide you in shopping for a child's toy. Don't overcrowd his cage with toys, but try to score new fun items regularly and move them into his plaything rotation.